Hortus Camdenensis | Abutilon pictum (Gillies ex Hook.) Walp. Half-hardy, evergreen shrub or small tree, upright, then spreading, with pendant, bell-shaped, yellow to orange flowers with prominent darker veins, from spring to autumn. To 5m. [RHSE, Hortus]. Originally introduced to the Glasgow Botanic Gardens by Mr. Tweedie, around 1837. [MB p.53/1840]. ‘A native of the banks of the Uraguay and of Buenos Ayres, whence specimens have been transmitted to us by Dr. Gillies and Mr. Tweedie. The latter, many years ago, sent home seeds, and plants have been raised of which flowering branches were communicated to us by Mr. Mackay, of the College Botanic Garden, Dublin, Mr. Moore, of the Glasnevin Garden, and from the Botanical Gardens of Glasgow and Edinburgh. Hitherto it has been treated as a greenhouse plant; in all probability it will succeed in the open air, especially in the summer months, and its gaily-painted flowers render it highly worthy of a place in every Collection. It flowers during various months of the year, and is easily cultivated and propagated.’ [BM t.3840/1840]. Listed only in the 1850 and 1857 catalogues [T.4/1850]. 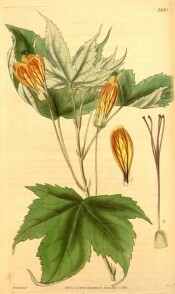 Abutilon striatum G.Dicks. ex Lindl. Sida picta Gillies ex Hook.